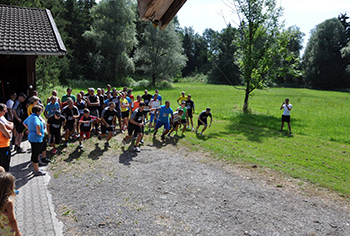 The fourth successive Hamberger company run took place on 18 July 2015 under the motto "Lachen, laufen, leben" (Run4fun). Mirco Meier from Hamberger Sanitary successfully defended his title as the "fastest runner" and was awarded the cherished glass trophy for the third time. With Germany experiencing a heatwave for the previous couple of weeks, Hamberger also wasn't to be spared on Saturday 18 July 2015. At a temperature of 32° C, this will definitely go down as one of the most sweltering company runs, especially in comparison to last year The start of the race was therefore brought forward an hour owing to the predicted heat. Stephan Greif and his team of helpers did tremendous work once again, ensuring not only the smooth running of the event but also creating a wonderful spirit of community for all employees. The helpers were at the start at 6.30 a.m., making sure that the runners and fans were not lacking anything. Especially with the weather so hot, cool drinks and sweet temptations lured people to the cake counter. The hungry were also catered for, with Manuel Wörl from the farm shop expertly negotiating his barbecue tongs through steaks, sausages and tender pork belly and serving delicacies from the Gut Filzenhof agricultural estate, arranged skilfully on plates draped with delicious potato salad. 44 runners registered in advance for the different disciplines. Once again there was a 10 km race, a 4 km race, a relay race and a children's egg and spoon race. The course as usual took the runners past the dam on the Inn and HLSC, thus avoiding the public roads. The 10 km race kicked off at 8.30 am with victory being claimed for the third time in succession by Mirco Meier (Sanitary) as the fastest runner in a time of 37 minutes and 58 seconds. The trophy for the fastest female runner went to Ingrid Hujer (Sanitary) in a time of 53 minutes and 56 seconds. 16 minutes later and it was time for the 4 km race to get started, which was won by Hai Au Nguyen in a time of 19 minutes and 38 seconds. The relay race caused the greatest excitement however with 59 runners registering in 15 teams. There was no limit to the creativity when it came to the names of the relay teams, with names such as "short-circuit mechanics", "ball lightning" or "last minute" causing a lot of laughs. The prize for the funniest relay name went this year to the "slow girls", who lived up to the name and crossed the finish line in last place. The relay race was won by the "sanitary" team of Florian Riesinger, Dieter Freye, Mirco Meier, Ralf Schwaighofer, followed by "pure talents" with Gernot Braunisch, Enrico Seilz, Christian Sumser, Manuel Steinbacher and the "hotchpotch" team with Johann Ranner, Marco Laszlo, Tobias Engelfried and Thoralf Lehnert. Dr. Peter Hamberger awarded the medals and certificates to every individual winner afterwards and thanked all the runners and fans for their commitment as well as all the helpers for their hard work. He announced that there would be another company run next year, to which everyone is again cordially invited with hopes for a big turnout of runners and fans. A special thanks also to the construction department who set up the tents and tables, the numerous cake donations, the company helpers (childcare, track marshals, timekeepers, those handing out the numbers and serving the cakes and the competition office), THW for its support, the Order of Malta and the Gut Filzenhof agricultural estate for their excellent catering.